Interracial Romance is our #7 choice for those who are looking for love, romance and interracial relationships. 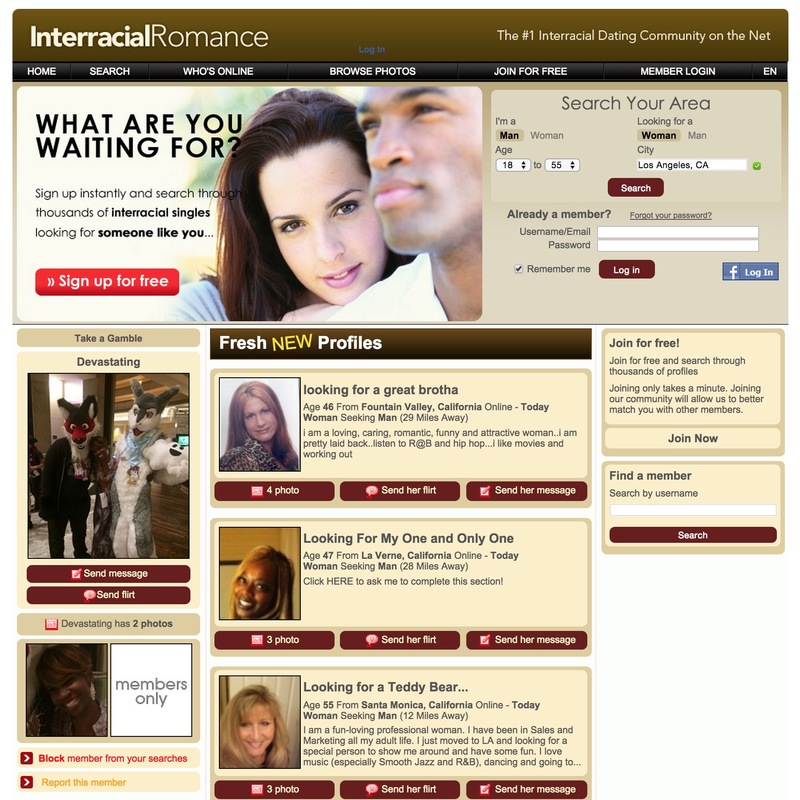 The site features several real men and women who are on the lookout for interracial relationships. It offers chat and forums along with many other interesting features to find love and romance online. You can search for a particular member based on the user name, even without joining the site. Apart from this, you can join for free within a minute and find excellent matches among other interracial members. Joining is simple, as you only have to fill in the particulars about your email address, user name, birth date and so on and give particulars about whether you are a man or a woman and what you are looking for. You can also write a headline for your profile information and describe yourself within 4000 characters. Here, you can write about what distinguishes your personality, your hobbies, talents and other crucial information for other members to get to know you better. You can then upload a photo and set it as your main photo after it is approved. However, the main photo cannot be a private one. The Home page offers several fresh profiles on a daily basis. You can see the photographs and view one photo, send a flirt or a message from the Home page. You can enjoy a three-day subscription trial for $7.95 or pay a monthly subscription of $29.95. There is also another option, where you join for a three month duration by paying $13.33 per month. Only paid members can initiate messages, whereas all members can receive messages and respond to them. However, both paid and basic members can send a flirt to another member. You can select any flirt from a drop down box. Free members can create their profile and upload photographs. They can then make a basic search for singles in their area and receive messages from others. You can also view your flirts in the Inbox, just like any other email message. You can make a search from the home page by specifying whether you are a man or a woman and what you are looking for, the age range and the city of preference. In addition, you can opt to receive alerts or newsletters in your email, by setting the appropriate option in the Email Option link. If you wish to block someone from sending you emails, you can visit their profile and set the Block Him or Her option, so that they will not appear on your search list or email you. All members of the site have access to a Little Black Book. They can add members of their choice to this book and this helps them to access details about the profile of the other member. For instance, they can access the private photos uploaded by that particular member. In the same way, other members can see your private photos only if they have you in their book. When you want to add someone to your book, you have to ask them authorization; so all members get to choose who will view their photos and other private information. If you are not interested in someone anymore, you can remove him or her from the book by going to the specific profile and clicking on the relevant link. You can sent an instant message or chat with someone who is online, by clicking on the Chat Now link near their profile, found at the bottom. However, members can choose to accept chats only from those who are in their Little Black Book, so they will not have the Chat Now link near their profiles. You have to add them to your book in order to send an instant message to them. Members can be added to Favorites or removed from the Favorites list by clicking on the Not Interested links on the Favorite page of the profile. The site is very useful and interactive and can be easily used by people belong to any race or ethnicity. This is because it is available in various languages. You can change the language of the site by opting for the preferred language found on the top right corner of the Home page, with EN or English being the default language. The site collects a lot of information regarding your views and opinions on life and regarding your personality. However, this helps the site to match you with better profiles that suit your personality. The free service is limited, but it does come with a three-day trial, which you can check out. The site allows you to build up a detailed profile and even the basic search brings in plenty of relevant results. We feel that it is quite a reasonably priced site and offers good value for the membership fee, as you stand a good chance of finding an interracial member near you.